Sadly, there are many stray cats throughout the United Kingdom. These cats may be stray because they have wandered away from their owners, been abandoned when their family no longer wants them or can no longer care for them or even have been born into a semi feral existence. 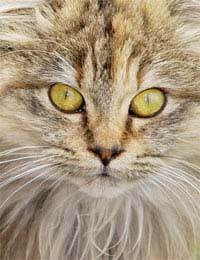 Finding a stray cat can be a stressful experience as the cat may be injured, ill or very frightened. Making sure that the cat is taken into a safe place where it can be given care, however, is important. Before taking any steps towards looking after a stray cat it is important to check and make sure that it is in fact stray. Cats are naturally resourceful creatures and can be independent of their owners. Whilst there are many cats who love lots of attention and cuddles, never roaming far from their owner's side, there are other cats who are quite happy wandering through fields and gardens. Quite often cats who appear to be stray are in fact much loved pets of people in neighbouring areas. Before deciding that a cat is stray it is important to check whether it is wearing a collar (this might also give the name and address of the cat's owners). If the cat is looking well fed and yet is not wearing a collar it could still be a far roaming pet. In this instance the cat may well go home of his own accord. If he doesn't, or if there is a risk that he may become injured (for instance if he is found wandering by a busy road) it is best to call an animal welfare organisation such as the RSPCA. The best place for a stray cat is an animal rescue centre. They will be able to give the cat a secure and safe home while ensuring that any injuries or illnesses are treated. If the cat can be enticed into a box or, better still, a pet basket or crate then this is the best way to transport him. Frightened or injured cats should never be transported loose in a car. If the cat cannot be enticed into the basket or box then it will be a case of calling the local animal rescue centre, RSPCA or other welfare organisation. Often stray cats become injured by traffic. Any injured animal becomes defensive and nervous after injury and cats are no exceptions. An injured cat will lash out if it is scared and will not want to be picked up. The best way to handle this situation is again to contact an animal welfare organization. If the cat, however, is in a place where he may get further injuries or if he is a risk to others it is important to move him. The safest way of moving an injured cat is to carefully cover him with an old towel or blanket before picking him up. This will contain his legs and more importantly claws. Moving an animal with broken bones, however, is really a specialist task and a call to the RSPCA or local vet before moving it is strongly advised. Making sure that a stray cat is taken somewhere where he can be given a safe and caring environment is important and will hopefully give him a new opportunity for a long and happy life. I have found a female tabby cat very friendly she followed me home she was very thin but has put on weight in the 2wks we have had her. I am not allowed pets it is cold and wet and she just likes to sleep and be petted and I don't want her in a cage. I have two adult cats looking for new homes due to a bereavement. Both tabbies, one female oriental talkative cat aged four years and one male shorthaired tabby cross male aged three years. I cannot give them the time they deserve and need a kind home for them either together or singly.